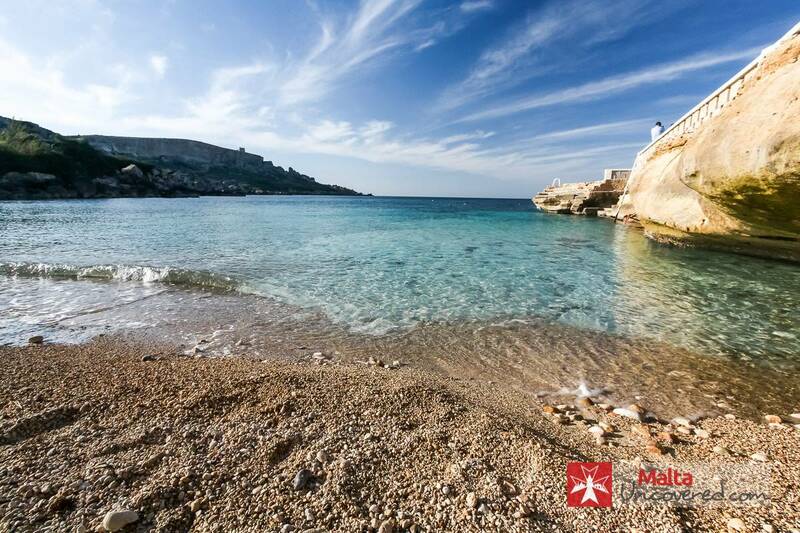 It’s no secret that Gozo offers some of the best beaches to visit. Unlike main island Malta, where beaches can get crowded pretty quickly in summer, beaches in Gozo rarely get too busy at this time of the year. If you’re considering staying in Gozo or planning a day trip to Malta’s sister island, here are a few personal suggestions for the best beaches around. Quiet, few man-built structures and clean. Ramla l-Hamra is the largest and most popular (sandy) beach in Gozo, and for good reason. With an almost red-coloured sand, and surrounded by mostly undeveloped countryside it’s an obvious favourite for both locals and tourists alike. It’s clean, there’s plenty of space for sunbathers and its shallow waters and easy access makes for a very family-friendly beach. If you plan to visit Gozo, this beach should be at the top of your list. Some parts of the shoreline are littered with pebbles, which can make entry to the water a little tricky. It’s a minor inconvenience, however. San Blas Bay is a beautiful little beach on the North coast of Gozo, which isn’t particularly difficult to reach but which discourages people who aren’t in very good shape to head down there. It’s not necessarily getting there that requires being in shape physically, it’s the steep hill climb that forms the biggest challenge. Pluck up some courage and make your way down, it’s well worth it. Clean, clear waters, secluded and only blemished by the small structure of a kiosk selling some drinks and snacks. Public transport (buses 304 – quickest – or 302) will take you to the top of the hill at San Blas, at the limits of the nearby village of Nadur. You’ll need a 15 min walk down to the beach. Can be tricky to get to, and even trickier to climb back up the hill after your visit. Dwejra Bay is located near the little village of San Lawrenz on the island of Gozo and is one of Malta’s most spectacular natural landmarks. On the rocky coastline, once the famous site of the breathtaking Azure Window (before its collapse in 2017), you can find interesting features like Fungus rock and the Blue Hole, which is a popular diving site as well. The “Inland Sea” is a shallow inland lagoon with a small pebbled beach and is a peaceful little oasis visited by swimmers and snorkelers alike. The bay is directly linked to the sea via a 60-metre long cave. It’s a good spot for snorkelling and there are excellent diving sites among the underwater caves and around the site where the Azure Window collapsed into the sea. Rarely gets busy – peaceful and quiet. Small pebbly beach, not really suitable for sunbathing. Not the easiest place to swim without a snorkel mask, since it’s rocky and rather shallow in most places it’s tough to gauge what’s under the surface. All in all, not very family-friendly – great for couples who are looking for something a little bit different, however. The small bay of Dahlet Qorrot is located in the North West part of Gozo, nearby the villages of Nadur and Qala. It’s a quaint, quiet place that rarely gets crowded and its pebbly beach is a nice place for a quick morning swim, with beautiful natural surroundings. Having a shallow entry it’s also a safe place to swim with kids, while the quayside offers an entry point to deeper waters, also easily accessible. Hondoq ir-Rummien (Maltese for Pomegranate Moat) is located on the Southern coast of Gozo, nearby the village of Qala and is a popular choice among the local population. For good reason – it’s a beautiful little bay. Quiet, secluded and surrounded by nature, as with most beaches in Gozo. The bright azure coloured water is super inviting to dive into. There’s a small sandy beach, although not much space for sunbathing. You can also enter the water via ladder, on the rocky part of the bay, which is nevertheless great for swimming and also snorkelling and beginner level divers, with several small caves to explore at water level. The bay has a great view of Comino and a local kiosk offers the convenience of getting refreshments. During summer nights, this is a popular location among Gozitans to fire up a barbeque and enjoy the fresh sea breeze after a hot summer’s day. Public transport won’t get you down to this beach so unless you’re hiring a car it might not be the easiest location to reach.